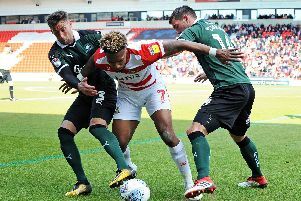 Doncaster Rovers might be just six games into the new League One season but they are already playing catch-up, according to boss Grant McCann. McCann's men host Luton Town today hoping to build on encouraging back-to-back draws with the division's early pacesetters Peterborough United and Portsmouth. Rovers' boss is a fan of target-setting and has challenged his team to reach a certain points tally after 12 games. Doncaster sit seventh in the early standings with nine points to their name. But McCann, who said this week he believes Rovers can win League One, is not where he wants to be. "I believe we're three points off where we should be at this stage, after six games," he said. "We've had a chat as a group and we looked at the first 12 games and where we think we should be. "We're a little bit off that. "So we've got six games to make it up now, starting with Luton." He added: "I think it's very useful to split the season into chunks. "I think you have to have a target. "You have to be realistic with it, of course. "But we're always seeking to be better and seeking to improve." Newly-promoted Luton, managed by Nathan Jones, head to the Keepmoat Stadium showing signs of acclimatising to the third tier - and are unbeaten in their last four games in all competitions. "I've got a lot of respect for the manager there. I think he's done a tremendous job and plays the game the right way," said McCann. "It's a big challenge for us. "They're another team who are used to winning, like Wycombe when they came here. "They're a good footballing team, they want to play through the thirds and try and open you up and create chances. "We know it's a tough game, and we know we need to be better at home. "We've got some points to make up on." Rovers are unbeaten, and are yet to concede a goal, at home in the league this season. But, following goalless draws with Shrewsbury and Portsmouth, are without a win at the Keepmoat since beating Wycombe on August 11.